1 Instituto de Ciencias del Mar y Limnología, Universidad Nacional Autónoma de México. Apartado postal 1152, 77501 Cancún, Quintana Roo, México. 2 Centro de Ecología Costera. Universidad de Guadalajara. Gómez Farías 82, 48980 San PatricioMelaque, Jalisco. 3 El Colegio de la Frontera Sur, Unidad Chetumal, Av. Centenario km. 5.5, 77014 Chetumal, Quintana Roo, México. 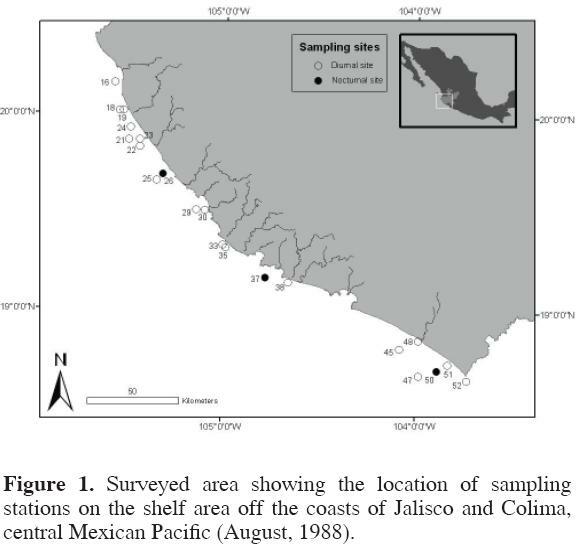 The composition, distribution, and abundance of the jellyfish community of a shelf area of the Mexican tropical Pacific were surveyed during August 1988. Zooplankton samples were collected along transects on the outer and inner sectors of the continental shelf to determine the structure of the jellyfish community and its variation in this area during the rainy season. A total of 23 species were recorded, with Aglaura hemistoma, Solmundella bitentaculata, Liriope tetraphylla, Pelagia noctiluca, and Rhopalonema velatum being the most abundant. The total abundance of medusae and of the most abundant species was statistically independent of depth and distance to the coast. Hence, the total jellyfish abundance of the most abundant species, and Shannon's Diversity index had a uniform distribution in both the inner and the outer shelf; furthermore, neriticoceanic forms and oceanic species occurred indistinctly over the entire continental shelf. On the outer shelf A. hemistoma and S. bitentaculata were most abundant; the former species, together with L. tetraphylla, weakly characterized the inner shelf jellyfish community. The narrowness of the shelf, the wide distribution of the most abundant forms, and the possible effect of local advective processes from the oceanic zone masked a definite gradient across the shelf. Three species have not been recorded previously in the Mexican Pacific: Amphinema dinema (Péron and Lesueur, 1810), Sarsia coccometra Bigelow, 1909, and Clytia mccradyi (Brooks, 1888). The finding of A. dinema is the first in the Eastern Pacific. Key words: zooplankton, continental shelf, distribution, marine ecology. Se estudió la composición, distribución y abundancia de la comunidad de medusas de la plataforma continental en el Pacífico mexicano durante agosto 1988. Las muestras de zooplancton provienen de transectos en las zonas externa e interna de la plataforma para determinar la estructura de la comunidad de medusas y su variación durante la época de lluvias. Se identificaron 23 especies; las más abundantes fueron Aglaura hemistoma, Solmundella bitentaculata, Liriope tetraphylla, Pelagia noctiluca y Rhopalonema velatum. La abundancia total de las medusas y la de las especies más abundantes fue estadísticamente independiente de la profundidad y de la distancia a la costa. Por tanto, la abundancia total de las medusas, la de las especies más abundantes y la diversidad de Shannon tuvieron una distribución uniforme en ambas zonas, interna y externa de la plataforma. Adicionalmente, las formas neríticooceánicas y las plenamente oceánicas se presentaron de manera indistinta a través de la plataforma. En la parte externa de la plataforma A. hemistoma y S. bitentaculata fueron las especies más abundantes; por su parte, la primera de éstas, junto con L. tetraphylla, caracterizaron aunque débilmente, la comunidad de medusas de la parte interna de la plataforma. La estrechez de la plataforma, la amplia distribución de las especies más abundantes y los posibles efectos locales de procesos advectivos desde la zona oceánica ocultaron un gradiente definido a través de la plataforma. Se encontraron 3 especies que no habían sido registradas previamente en el Pacífico mexicano: Amphinema dinema (Péron and Lesueur, 1810), Sarsia coccometra Bigelow, 1909, y Clytia mccradyi (Brooks, 1888). La presencia de A. dinema representa el primer registro de esta especie en el Pacífico oriental. Palabras clave: zooplancton, plataforma continental, distribución, ecología marina. The medusae, currently in the taxonomic group Medusozoa (Collins, 2002) are efficient pelagic predators that influence the abundance and distribution of different zooplankton groups either directly or by competition (Purcell, 1992; 1997). Therefore, studying this group represents an important step in understanding the dynamics of the marine zooplankton communities. Medusae are most commonly found and studied in oceanic waters, but many species also dwell in neriticcoastal environments, whereas others live in estuarine areas (Genzano et al., 2006). However, the distribution of these predators across the continental shelf has not been properly surveyed and is still poorly understood. Medusae can be quite abundant in neriticcoastal environments in tropical latitudes, especially during the summer (Brodeur et al., 2002; Ishii, 2001). Dense aggregations of medusae in neriticcoastal environments have called the attention to the dynamics of this community in nonoceanic areas (Mills, 2001; Genzano et al., 2008). The distribution and abundance of these gelatinous zooplankters has been studied in temperate and subtropical waters of the eastern Pacific (Alvariño, 1977, 1999; Arai and Mason, 1982; Brinton, 1986; Alvariño and Kimbrell, 1987) but efforts are relatively scarce in the tropical areas of this large region. Furthermore, the few studies on the distribution and abundance of medusae in the eastern tropical Pacific have focused on fully oceanic waters (SeguraPuertas, 1984, 1991). Hence, the shelfrelated medusan fauna of this region remains unknown; this is true also for the shelf area along the central sector of the Tropical Pacific of Mexico. This area was surveyed during August because (1) high medusan abundances were expected during the summer in the shelf area of the central Mexican Pacific and (2) it was likely that the hydrographic gradient across the shelf was relatively sharper than during other seasons as a result of the riverine influence along the inner shelf zone during this rainy period. Based on a set of surface zooplankton samples collected from the neritic areas off Jalisco and Colima, on the central coast of the Mexican Pacific, we studied the composition, distribution, and abundance of medusae; samples across the continental shelf were compared in order to detect differences related to the inner and outer reaches of this environment during the rainy period. Study area. The surveyed area is located between 18° 42' 30"N and 20° 09' 36''N, and 103° 40' 30"W and 105° 35' 00"W, and includes the coasts of the states of Jalisco and Colima, on the central Mexican Pacific (Fig. 1). The continental shelf off the surveyed area is narrow; along the 200 m isobath, its width ranges between 7 and 10 km. Climate in the zone is warm, and subhumid with a summer rainy season (JuneOctober). The coastal area is influenced by the runoff of at least 8 large rivers (Fig. 1). In this area water masses are related to the general hydrographic structure of the tropical Pacific (Filonov et al., 2000). The North Equatorial Countercurrent (NECC) is moderate in spring and summer, and during autumn and winter the NECC flows toward the coast (Kessler, 2006). Local surface circulation is seasonally influenced by wind direction and intensity. During the summer and early autumn, dominant winds are from the south. The Pacific tropical water flows northward reaching the Gulf of California; during the summer this surface flow moves along the Jalisco and Colima coastline as a branch of the NECC (Filonov, 2000). The oceanographic cruise "ATLAS V" was carried out during August 2329, 1988 on board the O/V "El Puma" of the Universidad Nacional Autónoma de México (UNAM). The survey took place along the continental shelf off the coasts of Jalisco and Colima in the central Mexican Pacific. Stations were arranged to allow detection of gradientrelated changes across the shelf; a group of stations was located in an area with the strongest potential effect of riverine drainage. A total of 21 zooplankton trawls were performed using a Bongo net (0.5 mm mesh size, 3.0 m long, 0.6 m mouth diameter). The net was hauled obliquely at different depths, depending on the bottom depth, but always across the thermocline (see Table 1) as medusae can be above and below it (see Arai, 1992). A digital flowmeter was adapted to the net mouth in order to obtain the amount of water filtered by the net; the amount of filtered volumes ranged between 350 and 1240 m3. Samples were obtained mostly during daylight but some were collected at night (Fig. 1). Medusae were sorted from the original samples and identified following SeguraPuertas (1984) and Bouillon (1999). The numerical abundance of each species was standardized to organsims/1 000 m3. Using these transformed values, we analyzed the changes of the overall medusa and individual species abundances at each station. A twoway ANOVA was performed to analyze the spatial distribution of the medusan numerical abundance (data transformed log(×+1)) at 2 distinct depth ranges: deep/outer shelf (65120 m) and shallow/inner shelf (1550 m) stations. The relation between the species and the general abundance of medusae with respect to the distance to coast was also evaluated (Statistica v5.5). 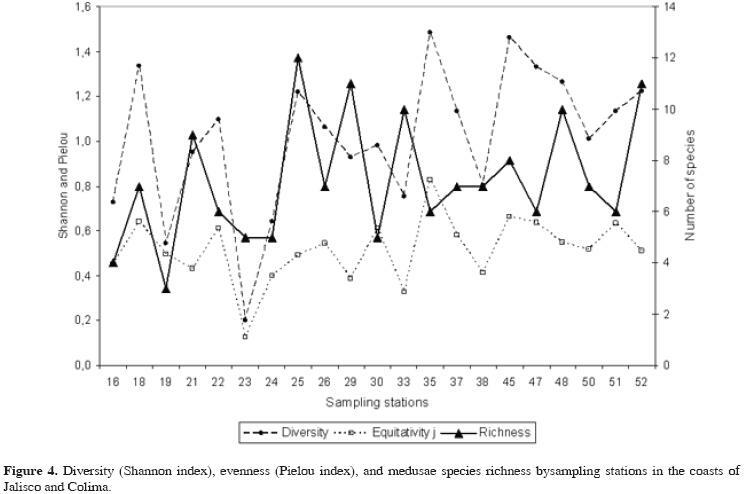 Shannon's Diversity H'(loge), evenness and species richness were also estimated. Oceanographic data were obtained at each sampling station using Niskin bottles with reversible thermometers. Salinity was estimated by conductivity. All measurements were made at different depth ranges: 2, 10, 20, 40, and 70 m; in some cases data were obtained from greater depths. 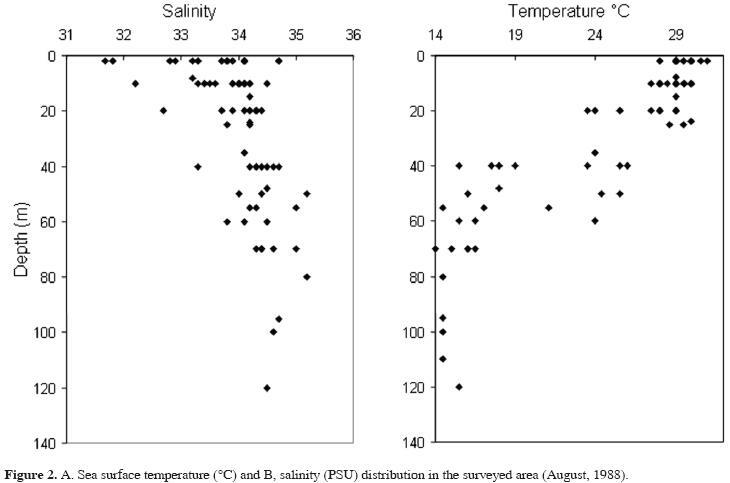 Temperature and salinity. Records of sea surface temperature (SST) showed values ranging between 29° and 31°C and a vertical decrease of 11°C at the 5070 m layer deep thermocline. Temperatures were highest in the shallow coastal areas (020 m) (Fig. 2). Temperature profiles during August are representative of tropical oceanographic conditions, with warm surface waters and strong stratification with a deep thermocline. 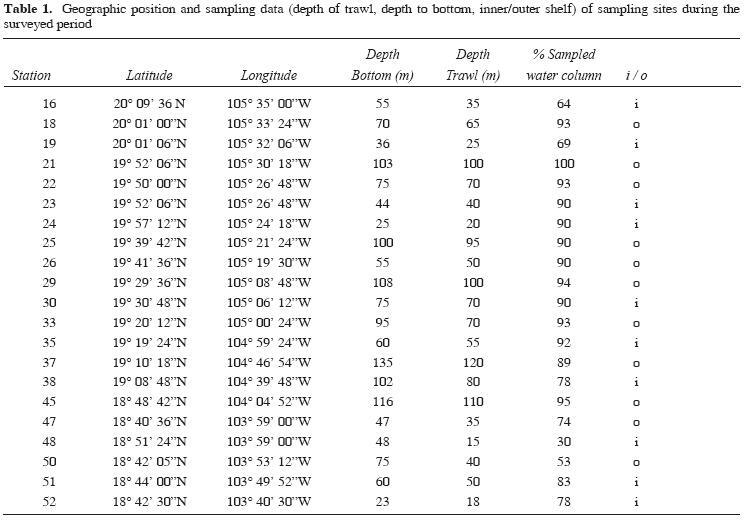 The distribution of surface salinity showed a high variability, ranging from 31.6 to over 34 PSU; more stable values (between 34 and 35) were observed at depths over 40 m. The lowest values (> 33 PSU) were recorded in the shallow coastal areas (020 m depth) (Fig. 2). Inner (1550 m) and outer shelf (65120 m) stations were identified based on depth to bottom, 10 stations were included in the first group and 11 in the second (Table 1). Abundance. A total of 8 895 medusae were collected during this survey. 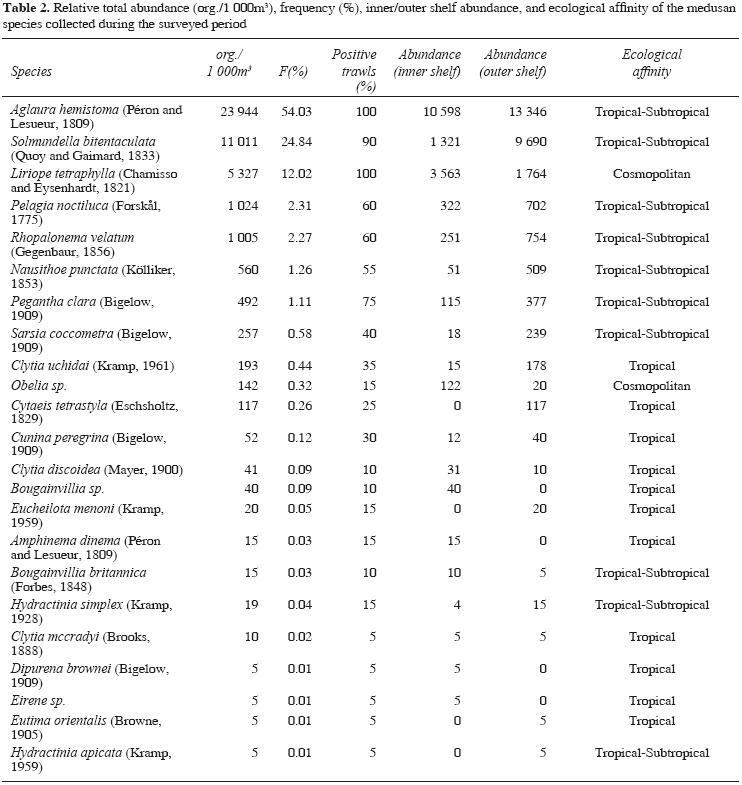 The taxonomical examination of this material yielded the identification of 23 species, including 21 of Hydrozoa and 2 of Scyphozoa, all of them tropical or subtropical forms (Table 2). Overall numerical abundance varied widely throughout the surveyed area. The highest medusan abundance was recorded at station 33 (10 638 org. /1 000m3), off the mouth of the Cuitzmala River, whereas the lowest abundance (151 org. /1 000m3) was recorded at sta. 19, in a shallow coastal area. In general, the medusae showed variable abundances in both deep (outer) and shallow (inner) areas of the shelf. They tended to be most abundant along the centralnorthern sector of the surveyed area (Fig. 3a). The average abundance at the 10 stations of the inner shelf areas was relatively lower (16 839 org./1 000 m3) than that recorded (28 169 org./1 000m3) at the 11 stations on the outer edge of the shelf. The most abundant medusan species during this survey were Aglaura hemistoma (overall relative abundance: 54%), Solmundella bitentaculata (24.8 %), Liriope tetraphylla (12.2 %), Pelagia noctiluca (2.3%), and Rhopalonema velatum (2.2%). Together, these species represented up to 95% of the total number of medusae in the area. Their local distribution and abundance during the surveyed period is presented in figures 3bf. It was observed that, in the outer shelf samples, the total abundance (26 256 org./1 000m3) of the 5 dominant species represented up to 60% of the overall medusan abundance in the surveyed area. Aglaura hemistoma was the most abundant species in both the inner and outer shelf stations, nearly half (47%) of its total numerical abundance was distributed along the outer sector of the shelf. Furthermore, the other 4 highly abundant species were also more abundant in the outer shelf areas but showed lower relative densities (S. bitentaculata 34%, L. tetraphylla 6%, and R. velatum 2%) in this zone. Among the dominant species only L. tetraphylla was more abundant at the inner shelf area; nearly 67% of its overall numerical abundance was recorded at the inner shelf stations. A few other species showed this pattern (Table 2). In general, the Shannon diversity index (H'loge) was homogeneously moderate (average 1.01 loge) in most samples. Values were variable and irregularly distributed; high and low values were observed at both the outer and the inner stations of the shelf throughout the surveyed area (Fig. 4). There were no statistically significant differences between the overall medusan abundance when comparing deep (outer shelf) and shallow (inner shelf) stations (F= 0.41, P= 052) and the distance to the coast (F= 03.04, P= 0.09). The ANOVA analysis performed with the abundance data of most abundant species of medusae (90% of accumulated abundance) showed that the differences in abundance were not significant in each of these species: Aglaura hemistoma (depth, F= 0.004, P= 0.99, distance, F= 4.11, P= 0.058), Solmundella bitentaculata (depth, F= 0.98, P= 0.33, distance, F= 0.62, P= 0.43), and Liriope tetraphylla (depth, F= 4.43, P= 0.57, distance, F= 0.24, P= 0.62). The 23 species of Medusozoa collected represent 34% of the species recorded in the eastern Tropical Pacific (SeguraPuertas, 1984, 1991) and 28% of those known to inhabit Mexican waters of the Pacific Ocean (SeguraPuertas et al., 2003). Our data on species richness cannot be compared directly with those from the eastern Tropical Pacific and adjacent areas because of different sampling efforts. However, the species diversity in adjacent neritic and oceanic areas along the Eastern Pacific (Gulf of California: 13, off Monterey Bay, San Diego, and Punta Eugenia: 1233, Gulf of Tehuantepec: 13, western coast of Baja California: 27) suggest that even with a relatively small sampling effort, the Pacific medusan fauna is reasonably well represented in our samples (Bigelow, 1909; Alvariño, 1969, 1999; FernándezAlvarez, 1981; SeguraPuertas, 1984; Brinton et al., 1986; Alvariño and Kimbrell, 1987). 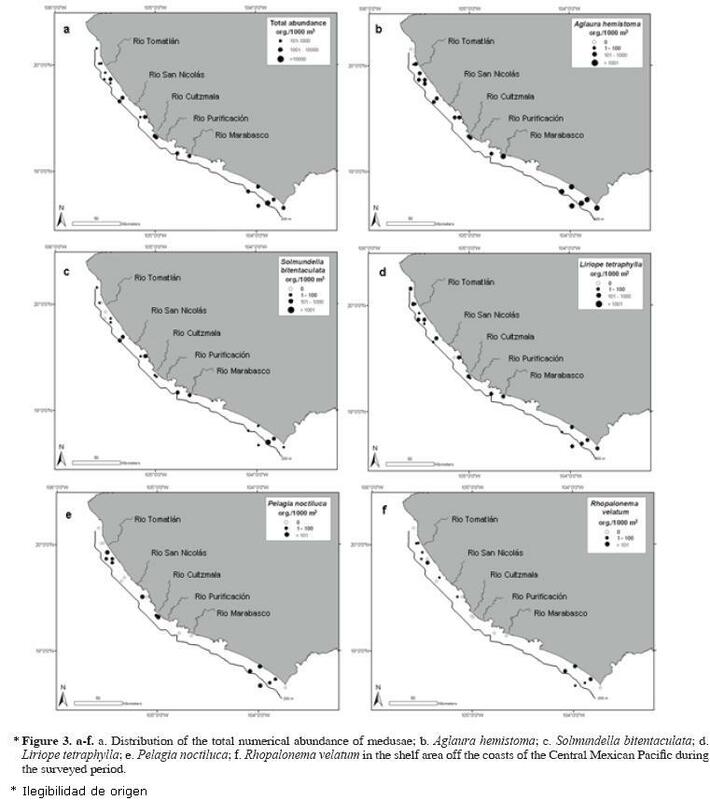 Almost all the species recorded in this survey have been previously reported in Mexican waters (Atlantic+Pacific) (SeguraPuertas et al., 2003), but there are 3 new records for the Mexican Pacific: Amphinema dinema (Péron and Lesueur, 1810), Sarsia coccometra Bigelow, 1909, and Clytia mccradyi (Brooks, 1888). The record of A. dinema is interesting for the Eastern Pacific; the species has been found previously off the Atlantic coast of Mexico but not in the Pacific. Furthermore, before Rees's (2000) record of Amphinema sp. off California, only 1 species of the genus was known in the entire Pacific, A. platyhedos, described by Arai and BrinckmannVoss (1983) from the North Pacific. It is a summer form in the tropical Atlantic (CanchéCanché and Castellanos, 2005); this could explain its occurrence in the area during this season. Also, S. coccometra was recorded previously in oceanic and neritic areas of Central America and off the Colombian and Ecuadorian coasts, in the eastern Tropical Pacific (SeguraPuertas, 1984). Its occurrence in the surveyed area seems to be related to the northward flow of the NECC and its influence in the surveyed area during the summer. Clytia maccrady is an oceanic form that can be found very close to the coastline, as in our samples; it has been recorded as the most abundant medusa in coastal systems of the Caribbean (SeguraPuertas and DamasRomero, 1997; CanchéCanché and Castellanos, 2005). The 5 most abundant species recorded in this survey are also frequent and abundant in the eastern Tropical Pacific region (SeguraPuertas, 1984). Overall, the medusan fauna in the surveyed area showed a strong tropical affinity during the summer, with some cosmopolitan and subtropical oceanic forms (Table 2); this profile was reported locally for other zooplankton groups (SuárezMorales and Zurita, 1991; Jiménez and SuárezMorales, 1998). During the summer, with the influence of the riverine drainage, the thermocline in the surveyed area was found to lay deeper (70 m, in average) than in other seasons (Filonov et al., 2000). According to Arai (1992), where a thermocline is present, which is the case of the surveyed area during the summer, medusae populations may be confined above or below the discontinuity or may be concentrated at the interface. Consequently, our results on the diversity, distribution, and abundance of the local medusae were not affected by the depth of sampling. In reference to salinity, many oceanic medusan species are unable to migrate into zones of lower salinity as those occurring at the inner shelf area; most medusae tend to avoid these changes of salinity (Mills, 1984). In spite of this general effect, the local variation of salinity along the inner shelf areas seemed to be associated with higher abundance of selected species; this is clearly the case of L. tetraphylla, known to be tolerant to salinity changes and to occur in different tropical areas and environments including estuaries and embayments (GómezAguirre, 1991; SuárezMorales et al., 1997). Although differences were not statistically significant, our data suggest a numerical increase in the overall abundance of the medusae in the outer shelf stations; these were located on the central part of the surveyed area, between 2 rivers, San Nicolás and Purificación (Fig. 3a). This weak tendency observed in the local medusan fauna is probably a result of the combined influence, in this particular sector, of (1) the local enrichment and increased plankton productivity related to the riverine input along the inner shelf area (FrancoGordo et al., 2001) and (2) the effect of local Ekman advective processes; these have been found to transport the plankton offshore and cause a detectable asymmetry of the zooplankton densities across the innerouter shelf gradient in the same area (FrancoGordo et al., 2001, 2004). Based on the physiography of the area and the presumed riverine input during the sampling season, a distinct acrossshelf gradient of the medusae was expected; this effect has been outlined in other shelfrelated areas (Pagès and Gili, 1992). A twofacies pattern across the shelf was also reported by Suchman and Brodeur (2005) for large medusae off northern California. The results of the ANOVA indicated a uniform distribution of the total medusan abundance and also of the most abundant species in both the inner and the outer shelf; also, neriticoceanic forms, and oceanic species occurred indistinctly over the entire continental shelf. The species richness and Shannon's diversity also showed a mixed pattern in the surveyed area, with relatively high values occurring in both areas of the continental shelf. There were, however, some species that tended to be distributed in the outer or the inner shelf. On the outer shelf area A. hemistoma and S. bitentaculata were clearly most abundant; the former species, together with L. tetraphylla, also seem to characterize the inner shelf medusan fauna. Hence, the designation of an inner and an outer shelf medusan community is weak, given only by the relative density of L. tetraphylla in each area; a general overview suggests a homogeneous acrossshelf community. The overall apparent homogeneity of the medusan community in the surveyed area may result from acrossshelf mixing of neritic and oceanic water due to (1) the effect of inshorewards winddriven advective processes, and (2) the narrowness of the continental shelf, which leads to a predominantly oceanic profile of the shelf zooplankton (SuárezMorales et al., 2000). It is suggested that these processes favor a degree of homogeneity of the summer medusan community along this and other parts of the shelf along the Mexican tropical Pacific. A similar effect, including weak acrossshelf differences, was described for siphonophores in the southern Gulf of Mexico (SanvicenteAñorve et al., 2007). Two of the dominant species in the surveyed area (A. hemistoma and S. bitentaculata) tended to be more abundant on the outer shelf. Both are regarded as cosmopolitan forms and are widely distributed in warm and temperate waters of all the oceans (Alvariño, 1977). In general, A. hemistoma is known to be most abundant in oceanic waters but it can be found at the inner reaches of the shelf (see SeguraPuertas, 1984). The high abundance of A. hemistoma in both the inner and the outer shelf environments of the surveyed area support the idea of the narrowness of the shelf allowing a stronger and extended oceanic influence across the shelf. Furthermore, the narrowness of the shelf probably conceals the detection of the riverine influence on the local medusan community. The same pattern is true for S. bitentaculata, also particularly abundant in the eastern Tropical Pacific (SeguraPuertas, 1984). In the surveyed area it was most abundant along the outer shelf and occurred also at the inner shelf areas; the same pattern was reported for this species in the Mediterranean (Pagès and Gili, 1992). It is among the best adapted medusae to transitional conditions. In the surveyed area it showed a much higher abundance (org./1 000m3) than that reported by SeguraPuertas (1984) in the same area and season (1001 000 org./1 000 m3), probably as a result of the increased sampling effort in the shelf. On the inner shelf areas (1550 m depth), Liriope tetraphylla was the second most abundant, agreeing with previous results in the region (SeguraPuertas, 1984). However, contrasting with the results by Pagès and Gili (1992), this species was most abundant at stations of the inner shelf. Also, the local abundance of L. tetraphylla is known to be enhanced by enriched waters, as reported by Goy (1973). Hence, it appears to be the medusan species that can take full advantage of the locally increased productivity of the inner shelf. Overall, the distribution patterns of these 3 species during the season surveyed were found to show variations related to local conditions (see Fig. 3). Pagés and Gili (1992) reported strong seasonal (wintersummer) fluctuations in the medusan diversity and shifts of the dominant species; hence, it is expected that winter conditions in the Mexican Pacific will produce detectable changes on the structure of the local medusan fauna. Such changes, including shifts among the most abundant species, have been reported locally for copepods (SuárezMorales and Zurita, 1991). In the surveyed area the local medusa fauna was largely dominated by a few species and the remaining ones occurred in low numbers only. Hence, the occurrence of these rare forms effects a local enrichment of species, but does not produce a major increase in the overall number of individuals. A similar pattern is known in other cnidarian communities linked with shelf areas (Gili and Pagès, 1987; Pagès and Gili, 1992; Gili et al., 1988; Gasca et al., 2003). Also, the presence of euryhaline forms, such as L. tetraphylla and P. noctiluca, mixed with fully oceanic forms has been reported from other shelf areas (Arai and Mason, 1982; Gili et al., 1988). This study was possible through the financial support of the Universidad de Guadalajara and the Universidad Nacional Autónoma de México. The authors would like to thank Manuel Guzmán for encouraging and technical support. Eduardo Juárez and Edgardo Minjares† offered valuable help during sampling activities. Lourdes SeguraPuertas†, the first author of this contribution, passed away on June 1st 2008, we feel honored to have had the opportunity of completing this joint work. The comments and suggestions from 3 anonymous referees greatly improved an earlier version of this contribution.